Where is Clip Art in Word and PowerPoint 2016 for Mac? Searching for and inserting Clip Art or pictures from other online sources from within Word isn't currently supported in Word 2016 for Mac. However, you can still add Clip Art and online pictures to a document by searching for the picture you want online, saving a local copy of it, and then inserting the copy you saved. Go to Bing.com, and select the Images tab in the upper-left corner of the screen. In the Search box, enter a keyword for the type of image you're looking for. 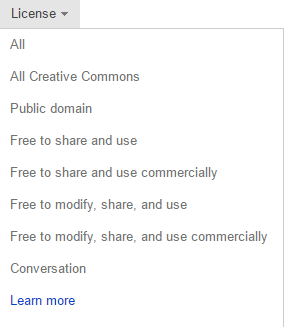 When the image results appear, select the License drop down menu, and pick the licensing option you want. 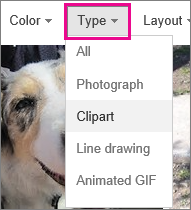 If you want to narrow results to clip art (cartoon-like images), add "clip art" to the end of your search term, or change the Type filter in your Bing image search results to Clipart. Click the image you want to use to see it full-sized (unless you want to use the thumbnail size). Use your browser's command to make a local copy. (In Safari, for example, Control + Click the image, and then click Download image). In your Word document, click Insert > Pictures, and choose Picture from File. Navigate to the location where you saved your image, select it, and click Insert.